Building a powerful, cheap and silent Linux NAS and HTPC server. UPDATE: Now contains a section on converting from Raid 5 to Raid 6. On the 2 of July 2011 Copenhagen had a very heavy storm with 150mm of rain falling in less than three hours and the Danish Meteorological Institute (DMI) recorded 18,602 lightning strikes in the same period, see cphpost.dk [english]. Beside flooding the basement and destroying old papers and notes the lightning also killed of my newly build server and my old DD-WRT modded WRT54GL router. Now a month later I have bought most of the components to rebuild the server and a new Asus RT-N56U gigabit router. The insurance company investigated the hardware and found it to completely wasted, but I had the option to by back my hard drives, so I could try to recover the data. Luckily my hard drives were all intact and I could rebuild my server with new hardware. The list is still based on the guide Silent Home Server Build Guide [www.silentpcreview.com], but now with an updated motherboard and CPU. This Mini-itx enclosure has 6 internal 3.5” bays and is rated as very quite in several reviews. I can now add it is only really quite if you under voltage the fans a bit. This little mini-ITX wonder has 6 sata channels (which is one more than the the Zotac G43-ITX), USB 3 ports, support for the newest Intel Core processors, HDMI and displayport out and dual antenna WIFI. It is a upgraded version of the Zotac G43-ITX I bought the first time I build this server. Eventhough I could easily have done with less I went for this quad core processor. It has been celebrated highly on various forums for it performance and pricing – especially when overclock (which I will not do for this build). This processor can easily handle the mundane tasks of serving ssh, web and software raid and on the long run do transcoding or gameserver hosting. I could do with 2GB, but the motherboard only has 2 slots, so I would rather upgrade now than later. 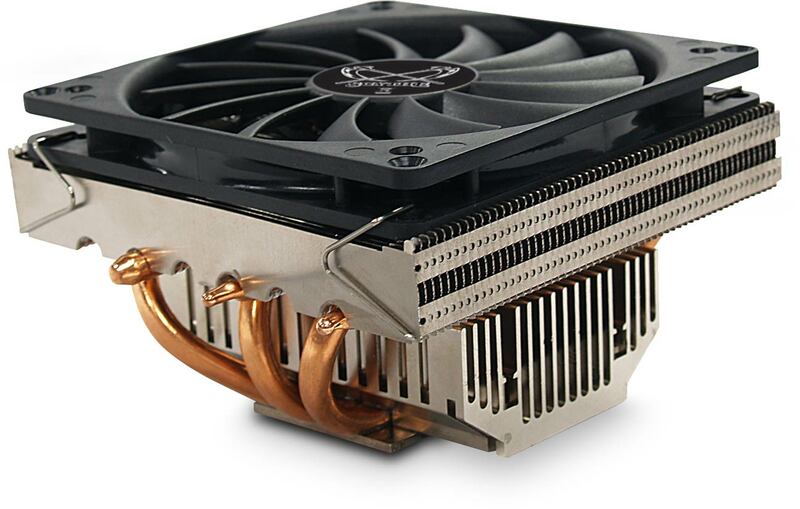 Since noise is an issue for me I could not handle the boxed Intel cooler and decided on this low profile PWM cooler. I wanted to make a raid 5, with one spare leaving me 2TB usable space. These disks should not use to much power and be reasonable quiet. Luckily my hard disks survived and I had prepared myself to recover the raid system on the disks using the commands below, but it turned out even more easy than I expected. Since I have used Linux software raid and not some proprietary card I had to replace the Debian installer (and most other Linux installers) automatically discovered my softwareraid and assembled it by it self – completely hassle free. Up until recently I was using 4 disks in a RAID 5 + 1 hot spare setup. This meant that if I experienced a disk failure the hot spare would immediately start to rebuild on the hot spare. This however leaves the disk system in a critical system where one more disk failure would destroy all the data. Using the same 4 disks it was also possible to use a RAID 6 setup which has dual parity data compared to RAID 5. This means that I could have two disk failures and still be good until I had installed new disk and started to rebuild on those. The internet is littered with reports of pros and cons of different RAID setups – and one often heard is the penalty on the CPU or RAID card is often mentioned as a disadvantage of a RAID 6 setup. Happily I can report that using a the the quad cored Intel Core I5 2500K 3.30GHZ – this is not an issue by any means. Converting a RAID 5 to a RAID 6 setup with a Linux software raid is quite easy especially since I already have a spare I can use for the extra parity data. Below is the command I used to convert my raid. 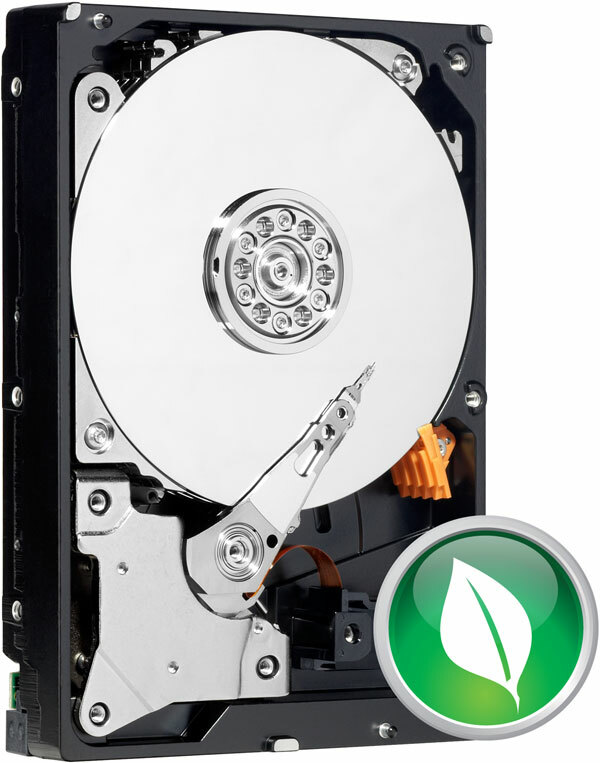 The backup file is located on a separate hard disk (the OS disk) and is used in the case that a powerloss causes problems during the upgrade. Finally the last thing I had to do was to edit my mdadm.conf with the path /etc/mdadm/mdadm.conf (On debian), such that the line “spares=1” changed to “spares=0”. Nice system, was looking for something similar so was really helpful. Are you using the video capabilities ? Are you using softraid ? I was planning for this type of system to use it with softraid. Hi Oskar -Yes, I am very happy about the video capabilities. I have a 40” LCD connected to the server through HDMI and sound by a separate mini jack cable to my stereo. The system has no problem playing HD resolution movies or DVD’s through a external DVD drive I have bought. I’ve read through so many bits and pieces of information that I had forgotten you actually mentioend you used software raid. So sorry for asking a question already answered. My question on the video capabilities was short. Can you also share a bit on what software you are using on top of the debian dist ? Have you installed media center software, xbmc for example ? What about handbrake ? Are these performing ok ? As you’ve connected it to a hdtv have you also been able to get a remote working with the device ? Did you need any additional hardware for this ? I was looking for a NAS initially but this setup can do so much more so why not use it for that. Hence having it work with a remote would be nice. For the case I was also looking at the Fractal Design ARRAY R2 MINI ITX NAS CASE W/ 300W SFX PSU, as that has a PSU built in with cables specifically for a small case and specific to the amoutn of disks you can install. Looking at the configuration the 300W PSU should suffice. 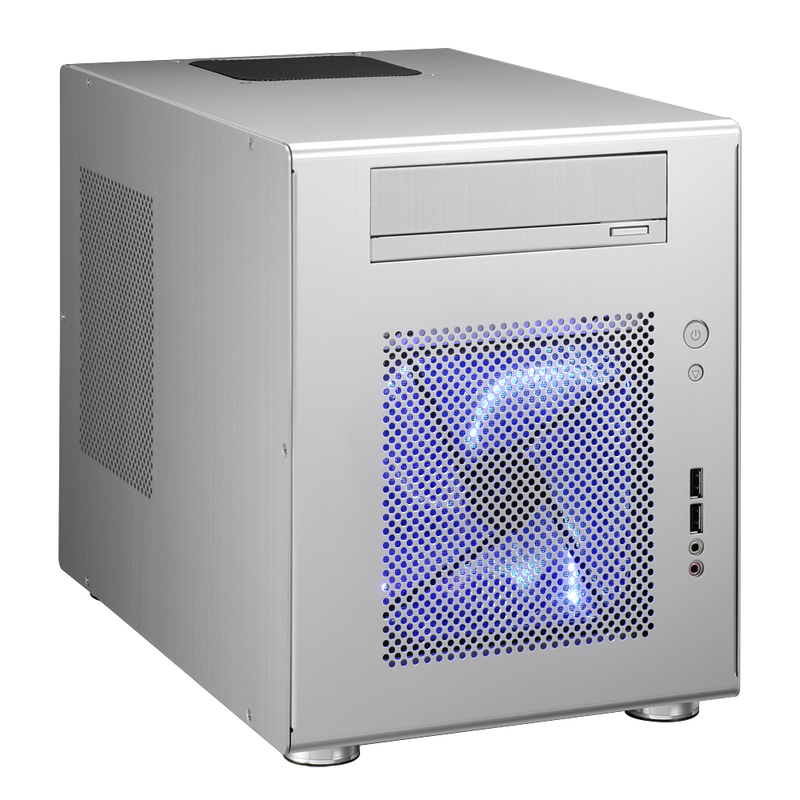 Btw Lian has just released another nice casing for a setup like this: Lian Li PC-Q25. I also looked at the alternatives of various commercial NASes, but hardwarewise they seem very overpriced. So was looking if I could built somethign myself. Software wise I also looked at software like freenas/openfiler but support is rather inactive. Next question was would what I had configured would actually work, this is how I got to your page which was almost an exact match. Keysonic ACK-540RF+ Black Wireless Mini Keyboard with Integrated Smart Touchpad. Regarding the Fractal design array R2 I also looked into this, but found that the reviews of the Q08 was very good in regards to interioir design and noise output. Great post (this one and the previous). I’me surprised that video is OK because reading a lot of XBMC forum, video hardware acceleration seems to be a nightmare with sandybridge processor under Linux. What about the power consumption vs your previous configuration ? Can you add to the Hardware Part also List and config of your HTPC/MediaServer/ITunes Server software? One difference is that he’s not RAIDing the linux OS drive, only the data drives. This probably avoids the issues described at the link since I’d guess that linux is doing that periodic I/O causing the heads to constantly unpark only on the OS drive. I’m also about to put a NAS together, but I’d like to keep the power consumption as low as possible. To stretch it even further, do you think a machine like that could even function as a small PBX server (Asterisk/FreeSwitch+Blue.Box for 5 SIP phones)? Cool article, I especially like how you go right through the RAID setup in the previous article and this one. I’ve been considering building myself a similar box, though I’d use 4x2Tb in 2xRAID1, then use LVM to give myself a redundant ~4Tb drive. Mirror provides good enough data redundancy for me, I’d prefer the space. Many of the small consumer NAS’s uses atom processors, so undoubtedly it will work, but most likely with a performance hit. If you decide to go down that route I would recommend to buy a dual core, so you are sure not to hit a wall when running several services at the same time. I don’t know the processor usage of a PBX service, so I can’t really help you there. Finally I think one thing to take into consideration is that the built-in GPU of the i2500K is working fine for displaying HD content on a 1920×1200 display, but you off course also buy a separate GPU along your atom CPU. Jamie: I can only recommend it. I am very happy with my setup. 🙂 I guess 2 mirrored RAID1 will give the same space as my RAID6 with the same disk. I use 2 disks for parity and you will use 2 disks as mirror. The only difference I can see is that I the in the case that you have 2 disk failures and these are on the same raid1, then you will have complete loss, whereas a raid6 with 2 disk failure is critical, but still not lost. But then again I might have misunderstood something. @Peter. I can speak for Atom processors, one would do the task of disk mirroring just fine. When people talk about Atoms being “low powered” they’re comparing them to current mainstream processors. A singlecore Diamondville Atom benchmarks similar to a singlecore Pentium 4. Definitely no slouch. I expect current model Atoms would be faster. I’m also on the hunt for a MiniITX Atom board for my box, finding one with enough SATA ports is the challenge. As for SIP I can only suggest to try it. Some of the guys on Asterisk forums are running 4-phone setups on old 400MHz boxes which perform fine. As Thomas said, an Atom-based setup may struggle with 1080p video. I want a headless file server (then use my TV to play media directly over DLNA) so this is of no concern to me. I do know that around their release, Atoms were touted as being able to do 720p flawlessly. I’m actually impressed by how similar our configurations are. I’ll write mine at the bottom. I think I’ll try to test Debian from a usb stick and see if it is capable to control my TV properly. I used to have an other Zotac (H55) before and I had no problem with the same TV but I had to change the MB because disks randomly disappeared from the up and running system so I lost my RAID 6 (since 3 out of 4 disks disappeared in less than 6 hours one day). It was a strange problem: upon reboot the disks were there. I thought the most likely culprit was the MB so I changed it and for some stupid reason I thought it was better to get the latest (H67) instead of an other H55. 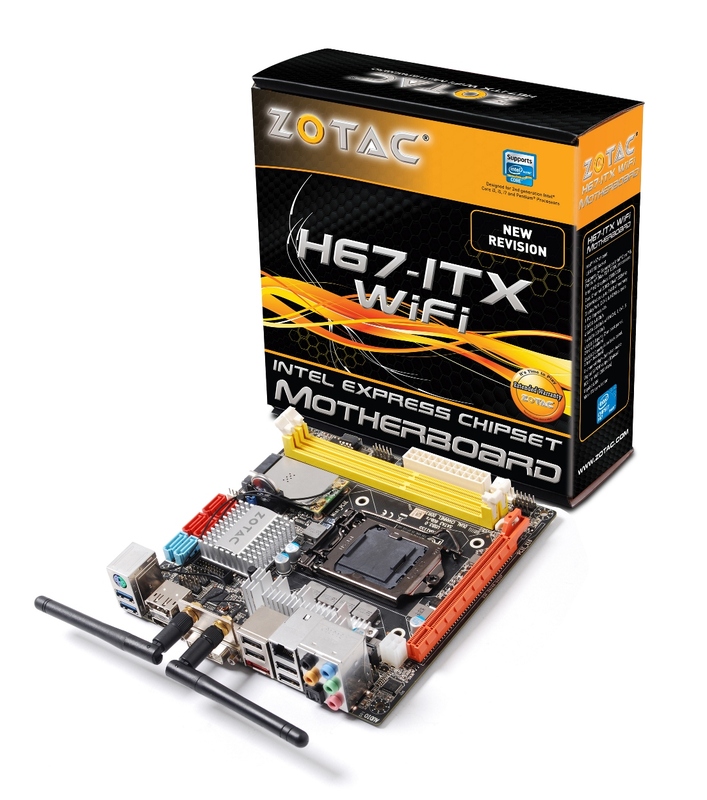 I couldn’t find any other mini-itx board with 6 SATA and WiFi! In fact, the only other with 6xSATA I could find is the P8H67-I from Asus, but as said there is no WiFi. I was heavily inspired by http://www.silentpcreview.com, so I guess that is why our build is so alike. 🙂 I had some problems using stable debian using the onboard (or in the i5 case the on-die GPU). My solution was to start using Debian testing instead that uses the 3.1 kernel which supports the sandy bridge gpu. I don’t know if this will solve your problems, but at least my setup with the i5-2500k works flawlessly over HDMI to my TV. i am thinking about taking the same case but i am wondering if its really possible to use 6 harddrives + opt + 2.5 ssd …. I updated to kernel 3.2.0-7-generic-pae and X.Org X Server 1.10.4 but things are actually worse. Now the screen is split AND flickering. Can you please tell me which kernel you use, send me your /var/log/Xorg.0.log and your /etc/default/grub? Thank you for sharing your experience! I would like to build a system similar to yours. Would you recommend similar components or would you change something? @Mike: Sure, I have 4 disks 3.5″ like Thomas plus 1 SSD for the OS. Did you find a mini-ITX with more than 6 SATA ports? @Mike: there is at least an other mini-ITX with 6x SATA that I know of that you might consider if you don’t need WiFi: P8H67-I from Asus. If you google a bit you could easily see the answer to your question. in the pic (http://www.silentpcreview.com/files/images/lianli-pcq08/09-inside.jpg) you can see from the top: a 5.25″ bay with external access, space for a 2.5″ drive (e.g. for the OS), the first cage for 4×3.5″ disk and the second cage for 2×3.5″ (but if you get a full video card you can’t have the 2nd cage). There are tons of reviews of this case online, I’m sure you can find any answer! have fun with your built. @Mike: that I cannot answer. I only have 4×3.5″ disks and 1 SSD and all cables fit. Absolutely no worries if you don’t have time to answer, but as I can’t fix my problem I’d love a bit more of your support. I finally found a way to run wheezy from USB and I was quite disappointed to see yet the same split screen which is haunting me. One “simple” answer might be that there is a bug in supporting 1024×768 (my TV is a bit old and this the highest res supported) and nobody noticed since nobody uses it. I’m sure the TV works fine since I can use it with my laptop over VGA and with my previous MB (Zotac H55) over HDMI. Do you mind setting your resolution at 1024×768 and telling me if magically the screen splits for you too (meaning you see twice the upper half but no bottom half)? I truly hope so! I tried to change the resolution of my TV, but unfortunately this is not possible (as far as I can see) on my Sony KDL40W5500 LCD TV, but I guess it would be a good test to try to hook you HTPC up to a 1080p TV just to check if this is the problem. If not it might be the GPU as you wrote as well. Hi Thomas and thanks for finding the time. Finally this issue will hopefully get a solution. It’s a driver issue and now I’m in touch with the guys developing it. it all just started a few hours ago. With your latest upgrade your server is almost identical to the one I built using your previous article as a guide. THANK YOU. I picked the very same Motherboard, a Core i5-2500s, and 4 x Green WD20EARS. I installed Debian Squeeze and upgraded the kernel using the backports to fully support the graphics adapter. Great to hear and I am glad to hear that you could use the article. I have since considered that a 2500s would have been more appropriate than my very overclockable 2500k. They only real problem is that my desktop now in comparison is quite slow I and I have found my self running heavier things such as batch image processing on the server rather than on my desktop as it is much faster. I hope that you will be as successful with wheezy as I am currently am. Hi, really interesting articles. I’m thinking about building a similar setup. Have you benchmarked performance since you did your rebuild? I’ve heard that Samba/CIFS is slower than NFS – have you ever done a comparison? I my previous article Building a powerful, cheap and silent Linux NAS and HTPC server, I did benchmark it using CIFS and it completely filled up my Gigabit network at 110MB/s, so it might be slower using CIFS compared to NFS, but I am not able to detect it looking at bulk transfer speeds at least. Hi Thomas. Very impressive system and I would like to do the same. I noticed that you could get the HD video out fine, how about HD audio such as dts-hd & trueHD. Would you be able to pass them through? I was reading your article about building your NAS and is very impressive, I really like it! But I have a question, in the previous article (before the lightning) you mention that you need to do a data scrubing in RAID5. I have heard with RAID-Z or RAID-Z2 you can avoid doing that because the way its done will always check your data. Do you have any thoughts about ‘regular RAID’ and ‘RAID using ZFS’? Thanks! and keep writing great articles! I haven’t really played around with ZFS, so I help you out with a comparison. However if you do regular Linux software raid it is a good idea to do scrubbing to ensure that there is no silent corruption going on. I still do this weekly in my new setup with RAID 6. You gave me a big idea for my first NAS build. It’s been a while for me to look on an alternative way to configure my NAS. The read/write speed on the cifs and FTP are way too slow. Maybe i should try the Debian like you mentioned on the post. Just wanna drop by and say thanks! Keep it up with your works! First off thank you for such an informative article. I’d like to know about your overall experience with mini-itx. I am looking to build a file server in the coming months and am seriously considering mini-itx so I’m trying to gather as many opinions on the form factor as I can. Can you elaborate briefly on your overall user experience with your board? I am generally quite happy. I chose the Zotac for two reasons – that it had many SATA ports and it supported the 2500K processor. To my surprise the built-in GPU of the 2500K was capable of running video two my TV through the included HDMI, so that was a nice addition. I guess the only thing that could have made it even nicer was that the HDMI also included sound, but I run sound to my stereo through the usual minijack ports. Beside being a bit crammed I must I admit I didn’t have hard time with anything – I guess the only thing that could be a hassle is if you want a full blown graphics cards in which case you need to see if the case supports the length of the card. My previous experiences was also solely with full-ATX cards before this build. Thanks again Thomas. For this build I’ll be content with using the on board HDMI out. One final question. What’s the thermal design power of your CPU. I’m thinking of getting a 35W CPU for the purposes of heat reduction. I’m glad you got your server up and running again. I’d like to thankyou for your video convertor software sinthgunt, its light, fast and simple to use. Hope to see more of such software from you. Its been a while since I looked at your original build, I to have build a NAS using the same Lian Li case and a variety of motherboards, and even a Raid card. I thought I would share some experience I had getting to where mine is now. This build ran for a year, with no issues. I had a lot of issues trying to setup a mdadm raid 5 on this system, with the advanced format 2TB drives, 4k sector size, and the older kernel, so I gave up on the idea, setting individual shares per drive. But the Atom system only used 50- 60w max, and it ran a Minecraft and Nexuiz server, as well as a Media tomb and samba shares to the home LAN. The Atoms are rather impressive and was faster than my P4 HT pc. But I came back from holidays and the IDE boot drive had failed causing some issues fixed by putting into the freezer over night, it booted the next day fortunately no data loss (yes it works). although a good system it had a PCI slot and only 4 SATA ports. Looking for a SATA raid card for a PCI slot and being compatible with 2 TB drives ?? Time for Iteration two (March 2012), the Atom board went into an ‘interim NAS’ using a cheap Aywun case and a 1TB SATA drive, this is running Vortexbox plus the Minecraft and Nexuiz servers hacked in. And it is still working flawlessly in the cupboard. Iteration two (March 2012). Having tried to look for a 6 SATA port motherboard, none were available or out of budget. Some people have asked if all the stuff fits inside the case, well yes it does! But this Raid card does take up the bottom part of the case preventing the use of the lower two drive bays. Thinking this was the best way to go, I started getting the parts together and rebuilding the NAS again. Then came the issues. Firstly came installing Ubuntu 10.04 LTS on the system drive, this was ok. Installing the RAID card bought problems with the Motherboard not able to allow the Raid BIOS to load. This was fixed with a motherboard BIOS update, then putting the RAID card into my old HP P4 machine to install drivers in XP, to update the firmware on the card (nightmare). But this motherboard is known for RAID BIOS loading issues. Once the BIOS and firmare was updated, Ubuntu 10.04 LTS was to old for the hardware, this was upgrade to a beta of 12.04. Attaching the Sata drives to the RAID card and setting them to a RAID 5 array was easy, But no matter what I did, the drive on channel 4 went offline, causing a degraded array. Looking through different forums showed that there were issues with RAID in the new kernel, compatibility between the Seagate Green drives and the Raid card. And there were post also looking at whether the power supply can cause issues with RAID arrays. 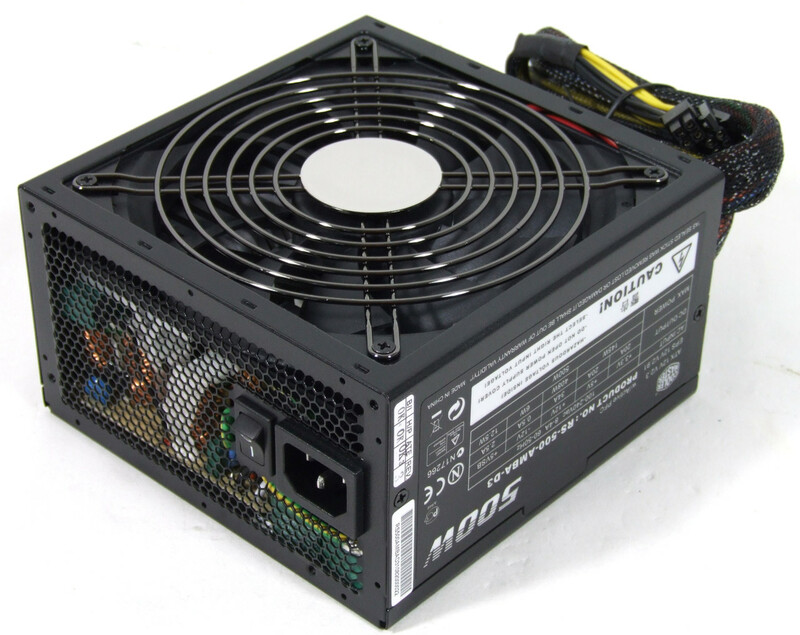 Replacing the power supply lessen the issues with the array degrading, but still not long term. So the NAS sat in the corner of the bench for a few months. It was time to seriously look at another solution, which leads to iteration three. 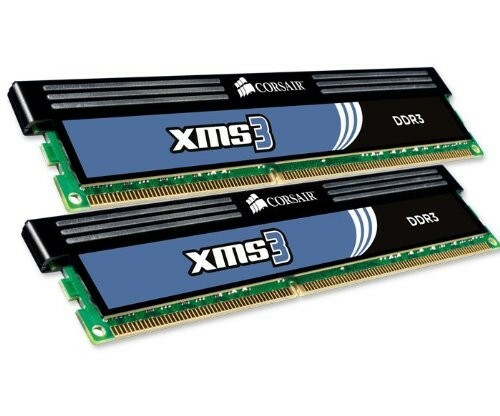 With the new motherboard, I decided to go with new ram and processer as they were cheap enough. The old motherboard is destined to become attached to the TV as a frontend. – It runs virtualbox, and the Media server, webserver, is running from one of these VMs. It has a tunercard installed ready for a MythTv backend to be installed. Software Raid is so much easier to setup, and so far has been good. The use of VMs means that the NAS can acts as other machines all in one box. It also means that the VMs can be shutdown when not needed or transfer to other hosts. The VM images live in a directory on the /dev/md0. Some are setup to use the NAS for files storage like the media server and webserver. A game server could be fully contained in the VM image. I have had all the drive bays filled in this case 1x 5.25″,1×2.5″, 6×3.5″ and there is still room for the cables. mine is in the cupboard so noise is not an issue. The NAS is so versatile and can be put to so many uses, only limited to the imagination and time to implement the next feature. I have a question: do you have any experience with fan control in linux / ubuntu? I have often a temperature alarm on the screen and I experienced a few times my server switching off. I have the Zotac H67 and Scythe Big Shuriken 2 so the problem shouldn’t be a cheap fan. If I remember correctly with the Zotac H55 I managed to have the fan going faster with the load, but it doesn’t seem to happen now. I am also surprised by the number of visitors, but I am just happy that others find my experiences useful. http://www.tjansson.dk/?p=325 – It details howto use lm-sensors and the built-in fancontrol. I used it to lower the fanspeeds, but I guess in your case you would need to have the fans on full all the time. Thanks so much for sharing you experiences. I’ve reached a point where I desperately need to back up content from a 1TB external HD and looking as NAS from Synology, QNAP etc. At present I stream content from PC to PS3 (Windows 7 using PS3MediaServer) – it works great, but obviously relies on making sure my pc is ready beforehand. I had been looking at whats involved in streaming MKV files from the NAS directly to the PS3. Most articles I ready that the NAS would definitely need an intel based CPU and then you’re looking at lots of money. Then I can across your article. I already build my own pcs, but it hadnt really occured to me to build a NAS/HTPC. I’ve used linux for running databases but have little knowledge when it comes media servers, etc. Most is based on your (Thomas’) original/this spec. Do you think the cpu could handle raid and media transcoding? Do you think i can cut back on anything? 3) Linux – i’m familiar with Ubuntu but from what i’ve read here, most people are using Debian. is there any particular reason why debian is better suited to this? It’s a no brainer if its quiet, extensible and does a whole lot more that serve files. Any advice appreciated. 2) The hardware is more than sufficient for just running filesharing and linux raid (both does cost much). If you plan to use it as a HTPC you might need a cheap graphics card with a HDMI port that can show the videos without tearing, but nothing to expensive as you do not need the 3D acceleration part. You could cut back on the memory, but that is so cheap that I would rather keep it. Finally I was quite pleased that I ended up with a i5 processor and a motherboard with a HDMI port as I do not need a external graphics card as the i5 has a Intel HD3000 graphics unit on die. The i3’s have a HD2000 which is less powerful, but might be able to run 1080p mkv (I am not sure on this though). 3) I run a variety on my systems, but the reason I decided on Debian testing was that it had the latest kernel at the time I needed this to support the graphics unit on my i5 2500K CPU. If you are intimidated you could try Linux Mint og Linux Mint Debian. 4) The HDMI works as the display – nothing more fancy than that. So when I boot the server and have my TV on I can see BIOS POST messages and Linux booting. I have just made a setup that autologins into a TV account that starts XBMC, so after a minute or 2 it is just XBMC. The audio is through a separate mini-jack cable as the HDMI is only graphics on my motherboard. I can really recommend a build like this over a boxed NAS unit as QNAP especially for the possibilities for expansion of functionality. On the other hand if you only need something for sharing files and silence is king a QNAP will be the better choice. Thanks so much Thomas. It’s really helpful. Size isn’t really an issue, lower noise would be better though. Sold on Debian, not scared to get hands dirty and like the idea of running up XBMC by default. I could run ps3mediaserver too and stream to ps3 in other room and use a NAS for my PC. This is sounding good. I suppose the question i’m asking is if i had an i5 chip and the asus mother board, would that work? The mobo has an 1 x Optical S/PDIF out, presumably i could stick this into my surround sound amp? The BeFenix case looks awesome, but I have no experinces with it. The reason I chose the Lian Li was the positive review on silentpcreview.com. My main concern was noise. And as long as the motherboard has a HDMI port out everything should be good. 2) Get a cheaper CPU and small fanless GPU with a HDMI port on it. You can chose a older version that is well supported on Linux. In both cases you could have the sound go over your stereo using S/PDIF or mini-jack. Total cost $536 without drives. hey thomas, well i bit the bullet and overall very happy with noise, size etc. went for debian wheezy (testing) which is getting set up step by step. learning a lot about linux over last few days. the raid volume is almost ready and so i installed xbmc – the problem i have now is that it doesn’t think my gfx adapter supports opengl so wont open the UI. did you run into any problems like this? Ok, i panicked! it’s fine. The VNC server I’d set-up was creating a new session, rather than remoting on to the console. Directly on the console everything is fine, well actually everything’s looking really good. 3TB of mirrored storage with space for another 4 drives. A HTPC that’s quiet and my wife can control from her iPhone (using XBMC remote). What’s your experience of fileserving? For other enterprise NAS I’ve setup, I’ve created iSCSI targets for VMWare ESXi – and not really sure about the best solution for my local setup. I’m thinking Samba or NFS share? Thanks again Thomas. You’re article was a significant influence in building my own NAS/HTPC rather than buying an off the shelf one. All in, i’ve spent about £650, which although is £150 more than equiv 4 bay NAS it’s so much better. I personaly use Samba and NFS as it is simple and provides good enough performance. I would only setup iSCSI targets if I really needed them – as they would complicated my backup plan and would make the overview of the files on the NAS less transparent. Hello Thomas, thank you for this great post. Well done! Question: what modification should I apply to get more (say double or more) space (e.g. 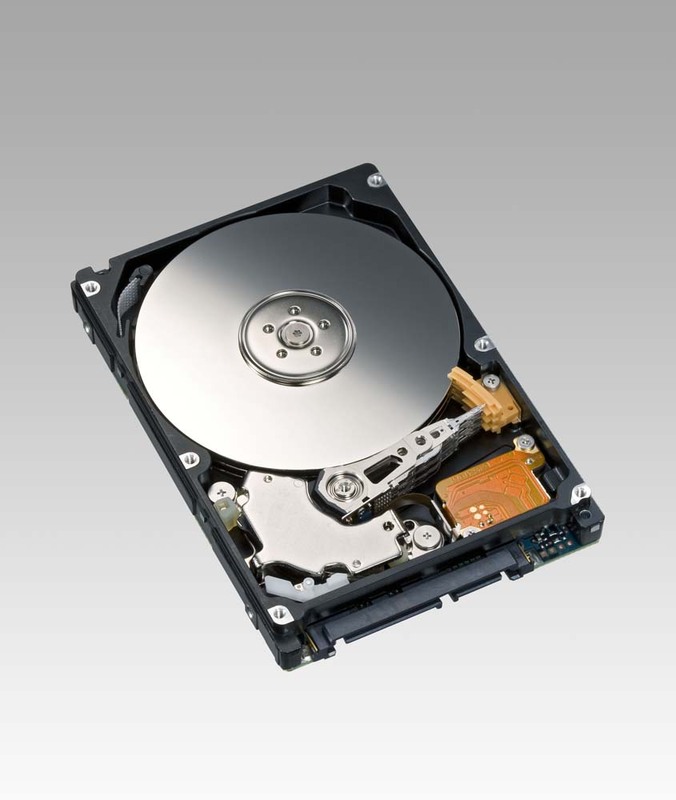 what disks) and what would be the impact on the ststem (more power consumption, more noise, …)? If you choose 4x3TB of these disks in stead of the 4 TB I used in a similar RAID 6 setup you would have 6TB of usable space the security of surviving 2 disk failures with losing data. Hey, have you measured the new builds power consumption? This build is about 55W when idling and 70W when loaded. I haven’t done anything to optimize this though, so I could possible lower it a bit by setting the time-out on the disks and under clocking the CPU. Simzdk: Jeg er ved at skrive en artikel om et andet fuldstændigt lydløst build (en workstation og ikke NAS), som du måske kunne blive inspireret af. Det kommer nok om indenfor en uge. En vigtig komponent hvis du vil bruge den som medie center er at vælge en med HD 4000 onboard GPU. Af diske ville jeg nok også vælge Western Digital’s Red serie – som er specielt lavet til NAS brug. Tak for svar. Ser umiddelbart ud til man snakker en Zotac H77 så, for at få Ivy Bridge support? Og måske en 3770S i7 dertil. Kan dog ikke gennemskue om der så er behov for anden køling? Ser frem til dit nye indlæg. Utroligt spændende læsning. Jeg har i dag en LG NAS med 4x1TB diske i. Jeg har 2 problemer med den nu. Den har efterhånden for lidt plads og jeg må konstant rydde op – og den kan ikke køre de medieapplikationer som jeg ønsker. Inden jeg begynder fuldstændigt at kopiere dit setup – har du så nogle gode råd med på vejen mht. hvad du evt. ville ændre i dag – skulle du bygge nyt setup? I seneste tråd nævnte du at du ville skrive guide på lydløst setup.. Støj er en faktisk i højsæde hos mig. Den og så elforbrug. Begge skal gerne holdes til et absolut minimum. Det fuldstændige lydløse setup er ikke egnet til NAS, da der ikke plads til nok diske, men kan findes her: http://www.tjansson.dk/?p=2119. Det build jeg har her på siden er ret støjsvagt og kunne nok gøres endnu bedre ved at bruge nogle high-end blæsere som f.eks dem fra. Noctua. Som det er nu larmer mine blæsere ikke specielt meget, men jeg har lidt støj fra harddisk brummen, som jeg har afhjulpet med lidt gafa. Hvis jeg skulle lave samme build i dag ville jeg nok opdatere cpuen (og dermed bundkortet tilsvarende) til den nyeste model i samme serie – det er dog vigtigt at den on-die GPU er hurtigt – Intel HD4000 kører rigtig fint med 1980×1080. En anden vigtig opdatering er at ændre diskene til WD red line som er lavet til denne type NAS/HTPC setup, se http://www.wdc.com/en/products/products.aspx?id=810. Nu er min liste næsten komplet.. men det er lidt noget rod med det motherboard kan jeg se.. det er stort set ikke til at finde et Zotac board med mere end max 5 sATA porte.. og det er 2×600 og 3×300 porte.. hvor stor forskel vil jeg mærke om det er 300/600 sATA porte? 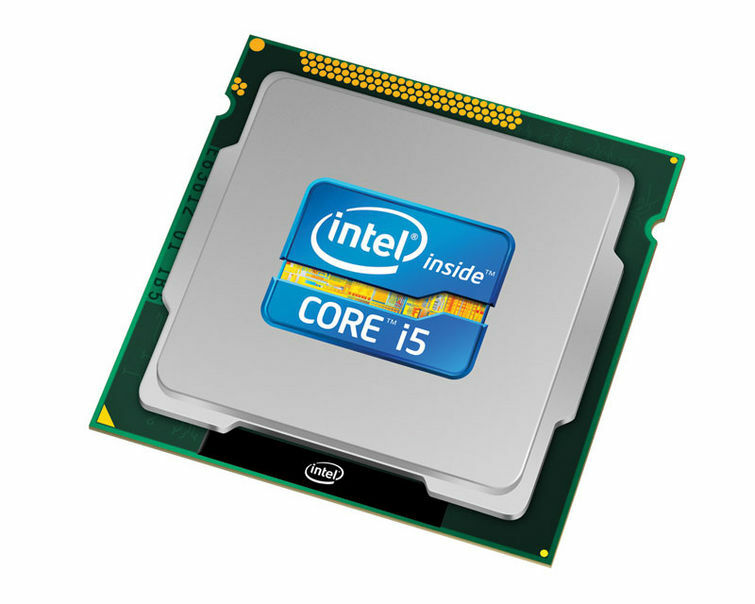 Min kollega var så venlig lige at gøre mig opmærksom på den nye Haswell CPU fra Intel – som har HD4600 GPU’en og kun 45w forbrug – i den model jeg har valgt. 2. Do you think that the i3-3220 (with HD 2500) is enough for playing 1080p 3D MKVs? Approx. 15GB in filesize each, H-SBS or H-OU mostly with 5.1 DTS and ~13Mbps AVC video stream. 1. In the setup you see on this page I now have audio over HDMI as well as the video. It came in one of the later kernels, so I think (I really I have no way to check) that you are good as long as you use a recent kernel. I am on debian testing with 3.10. Whether or not this is enough for a 15GB mkv file I do not know I has never tried. But 1080p and everything I have thrown at my XBMC setup has been fine. Nothing else was running on the network at the time of these tests (no up/downloads, no other devices turned on). Do you have an idea why the copy is so slow? 1. I do sometime have a bit of jitter in XBMC with sound over HDMI, but nothing persistent. If I have no sound I can just change the sound output to analogue and back to HDMI and the problem is resolved. It only happens every now and then and I haven’t noticed a pattern, so I don’t think I can help you. 2. My guess is that the Powerline adapter is the problem, and I am guessing that 300MBit/s is the theoretical max for the Powerline adapter, not considering noise and other items on the lines. A good test would be to attach a laptop or any other computer to the gigabit switch that the servers sits in and see if you can get proper connectivity. My desktop and server are on connected through two gigabit switches and I get around 110Mb/s over both NFS, CIFS (SMB), HTTP and SCP. A final thing is to make sure that the ports on the router is also gigabit and not 100Mbit/s. If the windows 7 desktop is connected through a 100Mbit/s port on the router this would be the limiting factor and you maximal transfer speed would be around 12.5Mb/s (100/8), which seems could be the explanation considering your samba and FTP speeds. Well my HTPC/NAS been quietly sitting there for about a year now. I went with Debian Wheezy following this blog… next up is taking the next version of XBMC which I think is called Kodi now, not Gotham? Have you done this? can you share experience?